An excerpt from What the Dog Saw by Malcom Gladwell, via Delancey Place. An interesting examination of fashion, and how the level of self-augmentation we take for granted today wasn’t always the norm. “Miss Clairol gave American women the ability, for the first time, to color their hair quickly and easily at home. But there was still the stigma — the prospect of the disapproving mother-in-law. Shirley Polykoff knew immediately what she wanted to say, because if she believed that a woman had a right to be a blonde, she also believed that a woman ought to be able to exercise that right with discretion. ‘Does she or doesn’t she?’ she wrote, [echoing her own mother-in-law’s disdainful comment ‘Fahrbt zi der huer? Oder fahrbt zi nisht?’ and] translating from the Yiddish to the English. 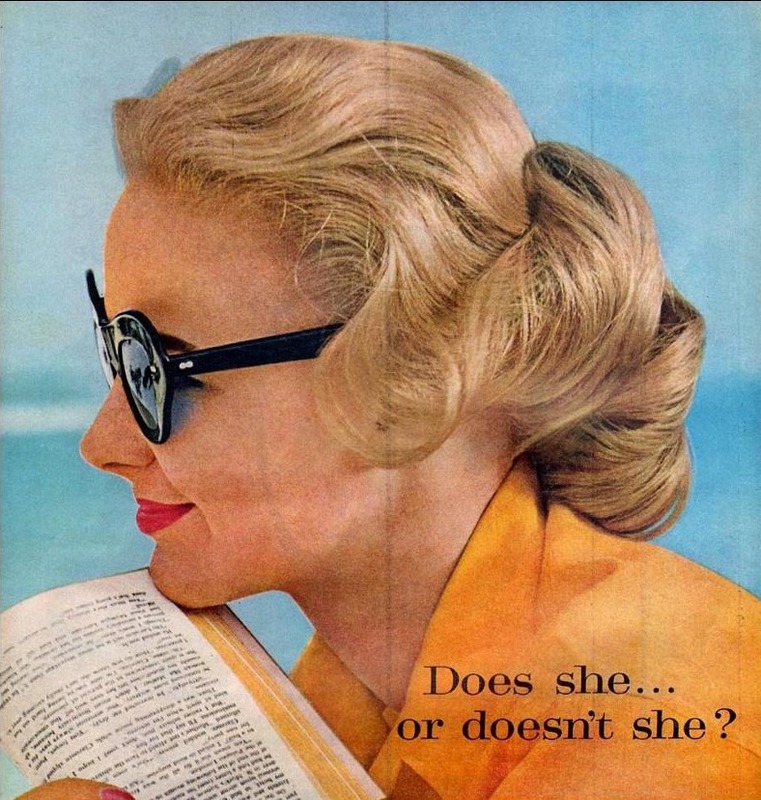 ‘Only her hairdresser knows for sure.’ Clairol bought thirteen ad pages in Life in the fall of 1956, and Miss Clairol took off like a bird. That was the beginning. For Nice ‘n Easy, Clairol’s breakthrough shampoo-in hair color, she wrote, ‘The closer he gets, the better you look.’ For Lady Clairol, the cream-and-bleach combination that brought silver and platinum shades to Middle America, she wrote, ‘Is it true blondes have more fun?’ and then, even more memorably, ‘If I’ve only one life, let me live it as a blonde!’ (In the summer of 1962, just before The Feminine Mystique was published, Betty Friedan was, in the words of her biographer, so ‘bewitched’ by that phrase that she bleached her hair.) Shirley Polykoff wrote the lines; Clairol perfected the product. And from the fifties to the seventies, when Polykoff gave up the account, the number of American women coloring their hair rose from 7 percent to more than 40 percent. “Today, when women go from brown to blond to red to black and back again without blinking, we think of haircolor products the way we think of lipstick. On drugstore shelves there are bottles and bottles of hair-color products with names like Hydrience and Excellence and Preference and Natural Instincts and Loving Care and Nice ‘n Easy, and so on, each in dozens of different shades. Feria, the new, youth-oriented brand from L’Oreal, comes in Chocolate Cherry and Champagne Cocktail — colors that don’t ask ‘Does she or doesn’t she?’ but blithely assume ‘Yes, she does.’ Hair dye is now a billion-dollar-a-year commodity.